In mid-December I assisted a film crew from Radio Television Hong Kong (RTHK) in the production of a documentary movie about the Bajau Laut in Semporna. During ten busy days we followed three Bajau Laut families in Bodgaya, Mabul and Bangau-Bangau, one boat living family, one family in a stilt house and one more integrated family in Semporna. In the process I got more insights about the life of the Bajau Laut – and its contradictions. In the first day of the production we entered the busy fish market early in the morning. Next to a huge pile of shell I met a young Bajau man from Bangau-Bangau who were waiting for fishermen with catches of live fish. Every time a fisherman arrived with a fresh catch, he jumped on to the boat to see what they had caught, and after some time he bought a large grouper for 50 ringgit that he tied to a stick and kept in the water near the pile. “I will wait till afternoon and then I will sell it to Chinese tourists”, he said. “I can get around 100 ringgit for the live grouper”. At the same time a group of fishermen brought two big dead manta rays to the shoreline. One of the fishermen cut the manta rays in half and handed over them to two young men with wheel barrows. Shortly thereafter the manta rays were put in ice and loaded upon the board of a small van. Everything happened quickly, so I guessed that the bargaining must have taken place on the boat before they hit land. I also noticed that people in the market made no or little notice of the rare manta rays. After some time, I contacted one of the fishermen who had caught the manta rays and asked him about the price. First, he seemed to regret that he had just sold the manta rays, but when he understood that I was not interested in buying them he said that he had sold them for 150 ringgit each, before he hurried away. One young man in the market told me that red-listed sharks were sometimes also put aside in the same fashion as the manta rays. Silently they are brought to the harbour, being bought by a middleman at sea and quickly hidden inside a van ready to take off for either Tawau or Kota Kinabalau, most likely for transportation out of Borneo. Hence, there is a very efficient logistic system for high-valued sea products – all the way from traditional fishermen to end consumers in finer restaurants in cities such as Singapore and Beijing. Some local Chinese Malaysian middlemen have direct contact with Chinese fish buyers and know how to bring the products out of the country. However, it is not yet illegal to hunt manta rays and some shark species in Semporna even though the butchering of manta rays have annoyed many tourist and conservationists in the area, as mentioned in this article: Tourists appalled by slaughter of shark and manta rays. The second day in Semporna we headed to Mabul where we settled in a homestay owned by a Malaysian engineer from Kuala Lumpur. Near the homestay I could see approximately 15 anchored houseboats and many Bajau Laut men, women and children who were selling fish and coconuts to Chinese tourists near the island resorts. I jumped into the water and swam between the boats and resorts to interact with the vendors. First, the Bajau Laut first made little notice of me but when they realised that I could speak Sinama one elderly woman started to ask me for money. When I told her that I could hardly have any money in the water, she asked me for my goggles. One older Bajau Laut man got very happy and declared that I was also Bajau Laut, we were “da bangsa”, one people. “The Chinese tourists have spoiled the market”, the owner of the resort later told me. “Before we could buy a bunch of crabs for 20 ringgit but now they cost the double”. As a matter of fact, many Bajau Laut have specialised in vending to the Chinese tourists and some of them even speak Mandarin. A coconut with straw in Mabul is now being sold for five ringgit. In islands with less tourists they are either given away or sold for only 2-3 ringgit. The next day we went to the other side of Mabul where we met with a local family that I have known for several years. The family consists of a man from Siasi, Philippines (Sama Musu), and a traditional Bajau Laut woman whose family originally came from Tawi-Tawi. They have five children. 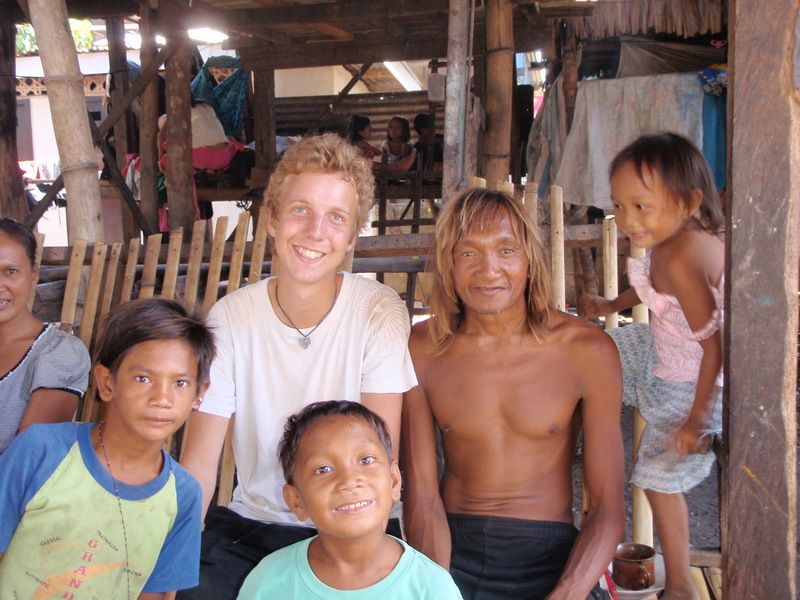 We asked them about the history of the Bajau community in Mabul and how they first came there. The man, Noedi, said that there were no resorts on the island when he first came there and that the Bajau community have been forced to resettle a few times since the early 90’s. While we were talking, the film crew used a drone to film the spacious resorts and the cramped Bajau community which is mostly made up by Sama Musu and Bajau Laut. On the other side of the island there is also a big Tausug community. Most of the islands’ residents have no legal documents, and most of them are from the Philippines. The following two days we followed Noedi spear gun fishing. On the second day Noedi caught a grouper that he kept alive in water, but when we asked him to sell the grouper to some tourists from his boat he refused. “I know many people here, and I will feel embarrassed if I sell it to tourists”, ha said. “I don’t want people to see me doing that”. That was an eye-opener for us. We had seen many men selling fish in the resorts and thought that all Bajau fishermen did so, but Noedi refused. As a matter of fact, Noedi preferred to sell his catch straight to a middleman even if he was likely to get less paid if he did so. On the journey back to Semporna we were accompanied by Noedi and his family, since they wanted to meet their daughter who works in town. While we were looking for the girl, we met a Bajau Laut couple who is related to Noedi’s wife on an anchored houseboat. Quickly, we agreed on following them to Bodgaya the next day along with Noedi’s family who also have relatives there. In Bodgaya we met up with the couples’ eight children and their in-laws. We also went net fishing nearby Bodgaya with five men on two wooden boats. Two men remained in the boats hitting the water with big sticks while the three others jumped into the water. They surrounded the fish and drove them towards the net. One man also used a speargun for catching larger fish. After some time, the fishermen pulled the nets into the boats. However, the catch was sparse and far from as opulent as some I have witnessed in Sampela where the same method is used. However, the fishing trip was just a showcase and they normally travel far from the community for fishing. The same evening, we witnessed a traditional healing ceremony performed by a local spiritual leader, a jin, in the village. The daughter of Noedi who had followed us to Bodgaya, suffered from hair loss and was treated by the jin, her uncle. He put the Quran on her stomach and recited holy verses, after which he fell in trance for a few seconds. During these intense seconds he came in contact with the spiritual world and found the reason for her problem: use of veil and the fact that she and her parents had pledged her necklace of gold. The houseboat owner, Kirihati, then made a lively depiction of that Bajau women only use headgear when they collect shell fish under the harsh sun, not in everyday life. After that, the jin gave her a temporary necklace that she would wear until she had retrieved her golden necklace. That night, the girl didn’t use her veil but when we came back to Semporna a few days later she used her scarf again, and the old necklace were nowhere to be seen. A few days later in Semporna, I met Kirihati and his family once again in the harbor. I noticed that all the children, including Kirihati himself, wore traditional charms that are supposed to protect them against disease and injuries. They invited me to enter the houseboat where I met an elderly man presented to me as Kirihati’s father. While we were talking he took out a pair of nice boots from a shoe box and told me that he was on the way to the mosque for prayer. The whole situation made me puzzled because none in Kirihati’s family had shown any interest of visiting the mosque. However, the old man told me that he had spent many years in the Philippines where he had married his second wife. He was now a practicing Muslim, and he even had a son who was studying in Zamboanga. He was in fact much less traditional than his son. Boat Living Bajau Laut – are They the Big Economic Players? After spending some time with Kirihati and his family, I was struck by the great costs of running a big house boat. Under the deck they have a huge diesel engine and beside that they have a smaller gasoline-driven engine used to pump out the water from the boat at night (which also makes a lot of noise). Consequently, some boat living Bajau Laut are the big economical players among the traditional fishermen in Semporna. A large houseboat and a big diesel engine can cost up to 50 000 ringgit, and they will have to pay more for using and maintaining the boat. However, they benefit from being able to move freely and stay longer at sea. Often, they also use smaller, faster boats for long-distance daily fishing trips, which enables them to make even larger catches. Unlike other Bajau Laut they can also sell their catch straight to fish buyers in Semporna instead of relying on middlemen in the islands. They also dry and salt fish which can be kept much longer before being sold. Hence, if a boat living family keep enough water, cassava, rice, oil and petrol they can stay for weeks on the ocean before returning to Semporna for another round of selling fish for a higher price and buying necessities for a lower price than in the islands. In the longer term, their economic equation simply makes sense. During my last day in Semporna, there was a raid for drug dealers and drug consumers in the communities of Kampung Halo and Bangau Bangau. More than 100 people were arrested and many of them will eventually be deported to Philippines. However, most Bajau Laut I talked to were little concerned by the raids and felt safe. As a matter of fact, the Bajau Laut are less likely to be deported to the Philippines because of their status as stateless. Everyone who is arrested by the migration police will be investigated by the Immigration department, but if you can prove that you are Bajau Laut you will not be deported (unless you have taken drugs, engaged in illegal fishing, etc.). In practice, however, police will seldom bother to scrutinize the Bajau Laut – their boats, their clothes, their dialect and their appearance will be enough for determining their identity. In this way, the Bajau Laut without identity documents are being kept traditional. This can most clearly be seen in Bangau Bangau which mainly consist of former boat living Bajau Laut from Sitangkai in the Philippines. Here, most of the residents have Malaysian identity cards today and many of them work in town. Some of them do even have their own cars and involve in long-distance fish trading. At the same time there is also a smaller percentage of the community who are not Malaysian citizens and they are much more likely to engage in traditional fishing. Some of them regularly spend days at sea in small “lepa lepa” boats. The last family we followed in the documentary is a clear example of this. The man, Joy, used to live in a houseboat outside of Maiga during his childhood, but today he is a Malaysian citizen and own his own tourist boat. If he is lucky, he can earn more than 500 ringgit a day bringing mostly Chinese tourists to the islands. At the same time, Joy has relatives in both Bangau Bangau and Maiga who don’t have any legal papers and who face a completely different reality. After ten days of filming and one week of meeting old friends, I finally left Semporna. The documentary is expected to be released in July in Radio Television Hong Kong (RTHK) and on Youtube. I will share the link with you. This entry was posted on February 5, 2019 by Erik Abrahamsson. It was filed under Uncategorized .